Consider a point on the ecliptic circle of ecliptic longitude . We wish to determine the altitude of this point, as well as the angle subtended there between the ecliptic and the vertical, hours before or after it culminates at the meridian, as seen from an observation site on the earth's surface of latitude . Figure 13: Parallactic angle in the case where increasing altitude corresponds to increasing ecliptic latitude. is the southern horizon, with and the south and east compass points, respectively. is the ecliptic. the meridian, and the zenith. is an altitude circle. The situation is as shown in Fig. 13. Here, is the point in question, and an altitude circle (i.e., a great circle passing through the zenith) drawn through it. We wish to determine the altitude of point , as well as the angle . Note that is defined such that it lies between the ecliptic in the direction of increasing ecliptic longitude and the altitude circle in the direction of increasing altitude. Moreover, is acute when increasing altitude, , corresponds to increasing ecliptic latitude, , and obtuse when increasing corresponds to decreasing . See Figs. 13 and 14. Incidentally, this definition is adopted in order to simplify the calculation of lunar parallax--see Sect. 6.4. 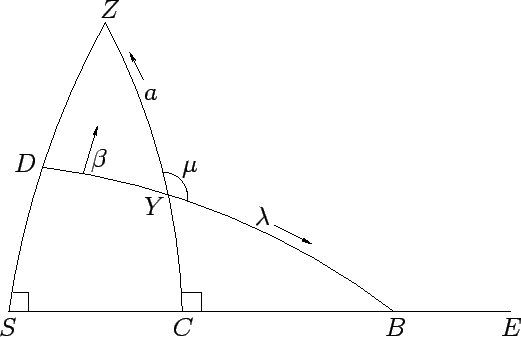 In the following, we shall refer to as the parallactic angle. 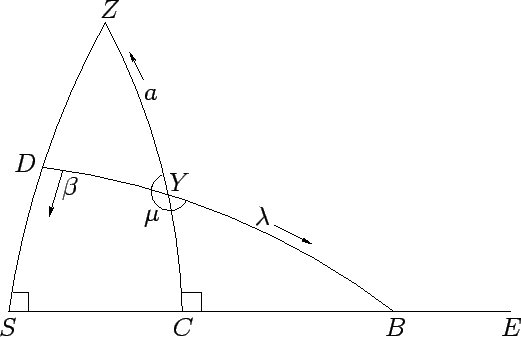 However, it should be noted that, according to the modern definition, the parallactic angle is . Figure 14: Parallactic angle in the case where increasing altitude corresponds to decreasing ecliptic latitude. is the southern horizon, with and the south and east compass points, respectively. is the ecliptic. the meridian, and the zenith. is an altitude circle. This quantity is significant because if then increasing altitude corresponds to increasing ecliptic latitude, whereas if then increasing altitude corresponds to decreasing ecliptic latitude. Thus, in the former case, is the solution of (57) which lies in the range , whereas in the latter case it is the solution which lies in the range . Of course, the above equation is only soluble if . However, it is easily demonstrated that if then point never sets, whereas if then point never rises. Note that the value of at represents the inclination of the ecliptic to the vertical as point culminates. Furthermore, the values of at (corresponding to ) represent the inclination of the ecliptic to the vertical as point rises and sets. Tables 18-26 show the altitudes of twelve equally spaced points on the ecliptic, as well as the parallactic angle at these points, as functions of time, calculated for a series of observation sites in the earth's northern hemisphere with equally spaced terrestrial latitudes. The twelve points correspond to the start of the twelve zodiacal signs, and are named accordingly. 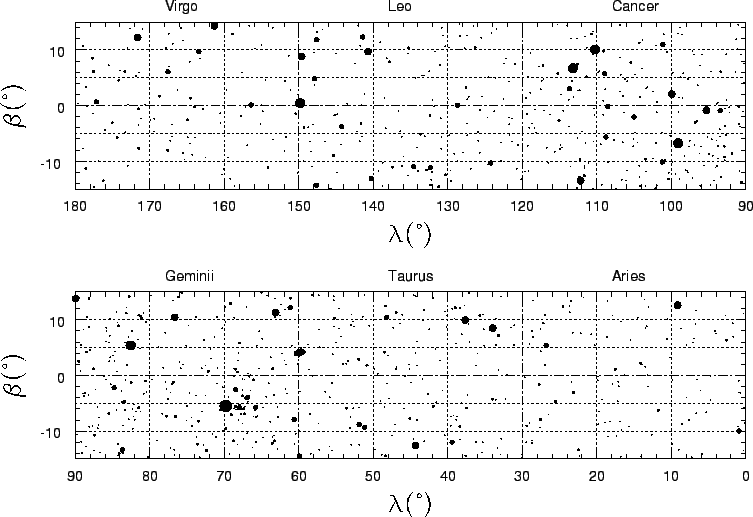 Thus, ``Aries" corresponds to ecliptic longitude , ``Taurus" to ecliptic longitude , etc. For each point, four columns of data are provided. The first column corresponds to the time (in hours and minutes) either before or after the culmination of the point, the second column gives the altitude of the point (which is the same in both cases), the third column gives the parallactic angle, , for the case in which the first column indicates time prior to the culmination of the point, and the fourth column gives the parallactic angle for the opposite case. Data is only provided for cases in which the various points on the ecliptic lie on or above the horizon. Table 1: Ecliptic longitudes (relative to the mean equinox at the J2000 epoch), ecliptic latitudes, and visual magnitudes of selected bright stars lying within of the ecliptic plane. Table 2: Declinations and right ascensions of points on the ecliptic circle (a). Table 3: Declinations and right ascensions of points on the ecliptic circle (b). Table 4: Terrestrial climes in the earth's northern hemisphere. The superscripts , , and stand for hours, minutes, and days, respectively. The symbols S and N indicated that the upper transit of the sun occurs to the south and north of the zenith, respectively. Table 5: Right ascensions of the ecliptic for latitude . Table 6: Oblique ascensions of the ecliptic for latitude . Table 7: Oblique ascensions of the ecliptic for latitude . Table 8: Oblique ascensions of the ecliptic for latitude . Table 9: Oblique ascensions of the ecliptic for latitude . Table 10: Oblique ascensions of the ecliptic for latitude . Table 11: Oblique ascensions of the ecliptic for latitude . Table 12: Oblique ascensions of the ecliptic for latitude . 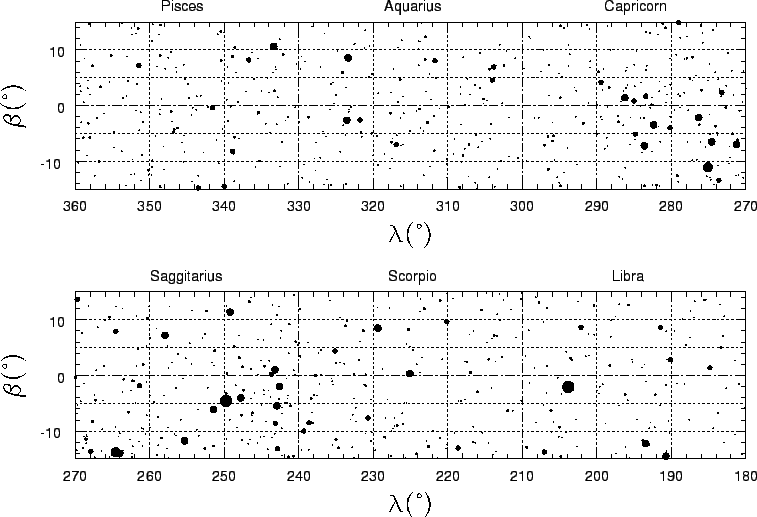 Table 13: Oblique ascensions of the ecliptic for latitude . Table 14: Oblique ascensions of the ecliptic for latitude . Table 15: Oblique ascensions of the ecliptic for latitude . Table 16: Oblique ascensions of the ecliptic for latitude . Table 17: Oblique ascensions of the ecliptic for latitude .